YOU take the cake! Going RAW! Today, I finished the raw crackers in the dehydrator and found that I needed to spread the mix a little thinner on the parchment paper. Three trays would be perfect and the crackers would turn out a little more crisp. Here are a couple pictures of the final crackers. 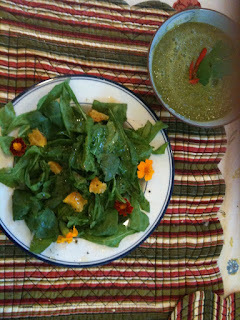 For dinner I made Pure Energy Soup and a Spinach/Arugula Salad. Here is a picture of all the vegetables that were used in the soup. I included a couple spicy red cayenne peppers in this soup recipe. Blend in blender until slightly warm. Hint: Add a couple spicy peppers for heat. Recipe from Go Green and Get Lean! Contact frogayoga@aol.com or phone: 541-664-4531 to order this book. Spread krackers on teflex sheets and score into 1" squares. Dehydrate for 10-12 hours at 105 degrees. Flip krackers and remove Teflex sheet. Contnue dhydrating 6-8 hours or until dry or desired krispness is obtained. The weekend was full of activity preparing raw food and taking trips to the local farmer's market and local farms to find the freshest, local and organic produce. I took a trip to Happy Dirt Veggie Patch farm to find another one of the rare tomatoes called the "Great White," finding one of these tomatoes is worth your effort for a taste bud extravaganza! Here is a spinach salad that I prepared for lunch with tomatoes, strawberries, onions, sunflower sprouts with a dressing of tahini, olive oil and lemon juice. Dinner for two includes a main course dish of the now famous "Great White" tomato along with cucumber, red pepper, sunflower sprouts, and green onions. This was like an antipasto plate complete with a tahini and garlic dipping sauce. 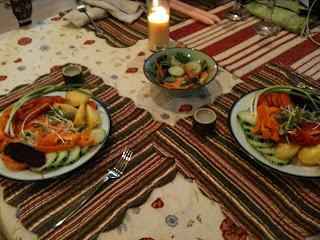 In the center is an Asian style marinade of raw apple cider vinegar and raw agave nectar with cucumber, tomatoes, and carrots. Soak the almonds overnight and rinse several times to remove the enzyme that helps to preserve the nuts for the squirrels :) not so much for us! Add the nuts to the Vita-mix with 3-4 cups of water. Strain into a mesh bag into a bowl or jar. Drain into bag and squeeze the remainder of the milk into the vessel. Today was a busy day with the car breaking down. So, I had to find raw food on the go. Luckily, had almond milk from yesterday and raw granola from the local-coop (Ashland Food Coop). 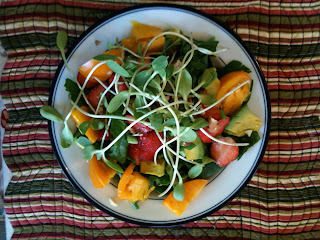 I created a rainbow salad from a stop at a local farm (Happy Dirt Veggie Patch) and fresh sprouts. Tonight a friend made a quick dish utilizing . . . raw corn, tomatoes, red bell peppers and avocado. Watch for how to make almond milk tomorrow. Visited the local co-op this morning and purchased a case of young coconuts, red chard, adriatic figs, raw almonds, raw buckwheat groats, bananas, tomatoes, avocados and some raw crackers. 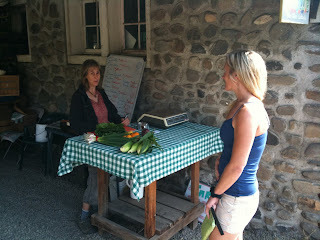 Raw prepared foods are very expensive, so look forward to preparing some recipes on our own! Coconut milk: A perfect food is the young coconut; they are packed with electrolytes and good fat. Acquire a large meat cleaver and make four or five circular cuts on the top or point of the coconut. Drink the milk inside as well as scrape out the meat to eat. 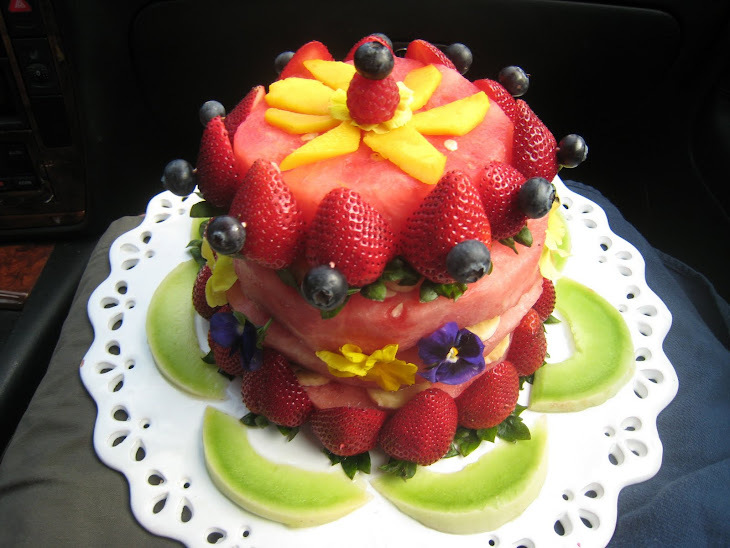 You may also use the meat and juice in raw food recipes. Almond Milk : Rinse and soak almonds overnight. Throw out the water after soaking. Blend the nuts in Vita-mix, use cloth bag to strain milk into jars. You may add a little raw agave nectar if you'd like! Today begins my journey in creating a habit of eating raw and living foods. I will share my experiences and recipes over 28 days. Handful of red chard, half a basket of Adriatic figs, and cilantro blended in a Vita-mix 5000 blender. I used a mini Cuisinart and mixed three cloves of garlic, raw almonds, raw olive oil and raw tahini. 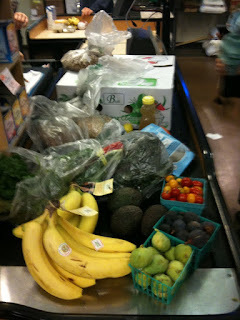 Here is my first day of eating raw food. Stay tuned for more adventure. After going to the farmer's market on Tuesday and meeting a couple influential people; I decided to create "Raw in 28 days" hoping to bring more health and vitality to my life. How to get Food Karma? Share your Veggies! Experience your "Raw Win" today!